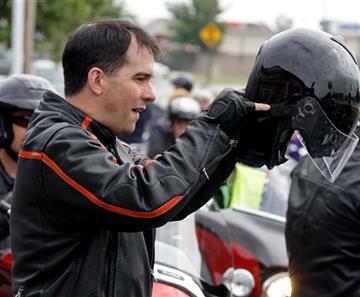 It’s starting to look like Scott Walker is gaining some serious momentum. Apparently, he wowed the CPAC crowd. And here is a clue, Jeb Bush didn’t even bother showing up. Walker in general has very positive numbers amongst GOP rank and file, but not among the GOP elite. In other words, the Rockefeller crowd. Which is probably why he scores so well amongst the rank and file. I’ll tell you the truth. It is my feeling, and my prediction, that nobody that the Rockefeller crowd approves of who will win in the general election. It’s just not going to happen. And as a personal note I figure that anybody that sets mega-ditz Cher Bono off as easily as Scott Walker does, deserves serious consideration. A story this good deserves a picture. I kinda think, the blog’s media library could use a picture, or two of Walker. Apparently I spoke too soon. He just hasn’t spoken yet. Of course, the word is that there are a large number of people who are planning on leaving when he does show up.